Alisa Harris’ new book, Raised Right: How I Untangled My Faith from Politics, is but the most recent of a growing number of books that take a close look at Evangelicals and Evangelicalism. Some of these books are written by Christians, who for varied reasons have left the Evangelical flock with which they formerly identified. Others are written by individuals who went underground, so to speak, in order to get an outsider’s inside look at the Evangelical phenomena. I have read several of these, all of which I found very interesting. Raised Right is no exception. It is well written, a quick and easy read. Harris is a graduate of Hillsdale College, a private college in Michigan with a reputation for quality academics and a conservative worldview. She is a journalist who has written for several newspapers and magazines, including the conservative news magazine, World. Harris was raised in an Evangelical Christian home where the line between Christian faith and conservative politics was not always clear. Acceptance of Jesus Christ as one’s personal savior meant commitment to free America from all forms of government regulation. Biblical verses like 1 Peter 3:15 and Luke 4:18 were interpreted in such a way as to blend the gospel of salvation by grace by faith in Jesus Christ with the hope of freeing Americans from the “shackles” of government, and redeeming the world for Christ through political means. Going off to Hillsdale College, a school that should have been “safe” for a godly young woman, is what began Harris questioning much of what she grew up believing was biblical teaching–girls were supposed to remain at home, under the protection and authority of their fathers until married. After marriage, they were supposed to have babies and raise godly children to carry on the struggle to save America, and through it, the world. Education was dangerous, especially for girls. Too much thinking and questioning would lead to her becoming a “liberal.” Indeed, as she began distinguishing between reality and myth, between biblical Christianity and American civil religion, she came under criticism by many in her home congregation. through human effort. Both failed, as both were destined to, and both will be resurrected again and again, only to fail again and again. like to quote Jesus’ Sermon on the Mount, but live as Social Darwinists. her ear. My hope is that many, especially those youth who come out of a similar background, will read and seriously contemplate this book. Until next time, be good to all God’s creation, and always live under the mercy. It has been my privilege to teach history at Belhaven College (a.k.a., University) over the past eighteen years. On October 18, 2011, I was asked to give a brief, seven minute overview of the college’s history. It was part of chapel program celebrating the one-hundredth anniversary of the college’s moving to its present location. Since several individuals have asked me about its availability, I am posting it below. Louis T. Fitzhugh founded Belhaven College for Young Ladies in 1894, when the city of Jackson had a population of only 10 thousand. The college was located on Boyd Street, a short distance from the present location. The Boyd Street property was formerly the residence of Colonel Jones Hamilton. Colonel Hamilton was a descendent of Lord Belhaven of Scotland. The name “Belhaven” was carved in the stone step at the entrance to the mansion and also on inscribed on the cut glass chandelier shades. It was perhaps for that reason that Mr. Fitzhugh chose “Belhaven” as the name for the college. Wise use of available resources has been a characteristic of the school’s leadership from its founding. In 1911, the name and goodwill of the college was donated to the Presbytery of Central Mississippi of the Presbyterian Church. The college was renamed Belhaven Collegiate and Industrial Institute and moved to its present location at 1500 Peachtree Street. It is that event that we are commemorating today. 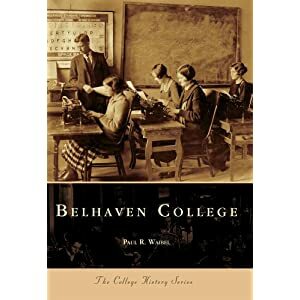 The name of the college was changed to Belhaven College in 1915. The new campus consisted of fifty acres. Much of that acreage was devoted to a farm and pasturage for a herd of dairy cows that provided most of the vegetables and dairy products served in the college’s dining hall. They also contributed to operational costs of the college. Student life on the new Peachtree campus was somewhat relaxed compared to what it was at the Boyd Street campus. Student life rules and regulations on the new campus would, however, be viewed as overly protective by today’s standards. Students who boarded on campus were not allowed to leave the campus without permission. A visit to the city of Jackson required not only permission, but a chaperon, as well. No visitors were permitted on campus during class hours or on Sundays. Students were allowed to have male visitors “only on express request of the parents.” Students could receive mail only from individuals whose names appeared on a list of approved correspondents provided the by the parents. All printed material owned by the students was subject to inspection by the dean. Students who were returning from vacation were required to inform the college president of the time of their arrival. Only parents could request permission for a leave of absence. Requests from students were not accepted. Over the years, student life regulations were relaxed, or should we say “liberalized.” Still, during the 1930s all hours of the day were regulated. Specific times for study—e.g., six hours per day for freshmen– and a designated time for lights out at night were still enforced. Students were required to spend Sunday afternoons between 2:30 and 4:30 p.m. in their rooms, quiet. One absence per semester was allowed for freshmen, and up to three were allowed for seniors. Any more than the allowed number resulted, as it still does, in a decreased GPA. Protecting the welfare of the women on campus required that they be subject to more restrictive regulations. They had to sign out of dormitories a take care that their whereabouts were known by their dorm hostess at all times. Off campus dating privileges and attending dances at nearby Millsaps College or the University of Mississippi’s School of Medicine were granted only upon a letter of permission provided by the parents. One of the more dramatic changes during the mid-1950s was in the dress code. Shorts and blue jeans could be worn everywhere on campus except on the front campus, the school offices, the dining hall, the library, and the classrooms. A further change in college life resulting from the admission of men was the introduction of varsity sports. Intervarsity sports were discontinued in 1936, and replaced with intramural activities, including an annual “playday.” The 1956 yearbook included pictures of the men’s varsity sports teams. The men’s basketball team won regional and national recognition during the 1970s. The tennis team won the NAIA national championship in 1983, and a football program was introduced in 1997. There is so much more that could be said, if time permitted. The history of Belhaven University is may be likened to one of the one of the “stately pine trees” alluded to in the school’s Alma Mater. Planted by godly men and women more than a century ago, nourished over the years since by faithful men and women, Belhaven University today is a testimony to God’s ongoing Grace. Paul R. Waibel, BELHAVEN COLLEGE (Charleston, SC: Arcadia Publishing, 2000). James F. Gordon, Jr, A HISTORY OF BELHAVEN COLLEGE, 1894-1981 (Jackson, MS: Belhaven College, 1983). There seems to be no end to the books by or about survivors of the Holocaust and World War II in general. I believe there are two main reasons why such books keep appearing. First, there is the attempt to understand how some human beings can subject other human beings to such suffering as recounted in these memoirs and histories. Second, and related to the first, is our fascination with the ability of human beings, individually and corporately, to survive under the most challenging circumstances. I remember the Nobel laureate and Auschwitz survivor, Elie Wiesel, saying that we have every reason to give up on the human race, but we must not, and will not. Of course, this raises the whole question of what makes a human being “human.” That question lies at the heart of some of the best books of every genre. Caroline Moorehead’s new book, A Train in Winter (New York: HarperCollins, 2011), has all the elements of an interesting narrative of war: heroism, survival, betrayal, even a touch of mystery. It is the story of 230 French women of varied backgrounds, who chose to become part of the French resistance during World War II. Many were political “leftists,” Communists, supporters of the Republic during the Spanish Civil War. They were also French patriots. Patriotism was not the only motivation behind the women joining the resistance. Those who chose to “save” some of France from German occupation were the conservatives, individuals like the hero of the Battle of Verdun in World War I, Marshal Henri Pétain, and the collaborator, Pierre Laval. They shared many aspects of Fascism. For them modernism, especially anything that smacked of women’s liberation, was evidence of the moral decadence that led to France’s defeat. It was this view of women as “ideologically and politically inferior beings” that motivated many of these women to join the resistance. The story of these brave women is one of heroic sacrifice. Moorehead presents their struggle against one of history’s greatest ideological villains in a manner that solicits feelings of admiration, respect, and pity from the reader. We have a natural tendency to praise those who resist the conqueror, unless of course, they are resisting our occupation of their homeland. Also, we tend to overlook it when the occupier is one of our allies. As a historian of the twentieth century, I feel the need to add a note of caution. Despite their heroism, we must ask how effective was the French resistance? Apart from defending the perceived honor of France, did their efforts contribute anything to the ultimate liberation of France, or the defeat of Nazi Germany? The honest answer must be “No!” Charles de Gaulle, leader of Free France, urged the resisters not to kill Germans. It would, he argued, lead only to reprisals. There would come a time for armed resistance, but that had to wait for the right moment. We resist the thought that their suffering was in vain. They may well have played a truly meaningful role in France’s liberation, if only they had accepted the leadership of General de Gaulle and the French National Committee of Liberation. Moorehead has done well in making sure that they will not be forgotten.